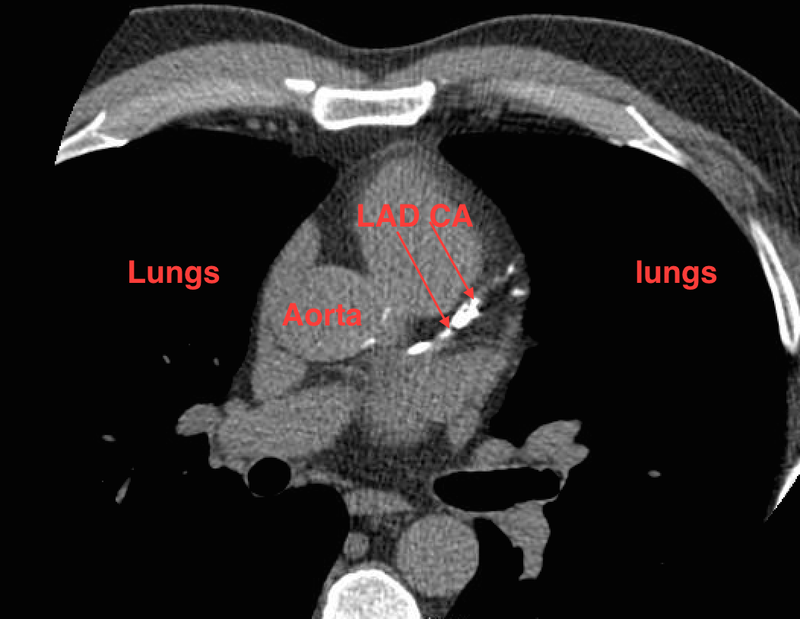 Yesterday, I laid out the case for utilizing coronary artery calcium score (CACS) to further refine the assessment of youngish patients risk of developing cardiovascular disease (ASCVD). 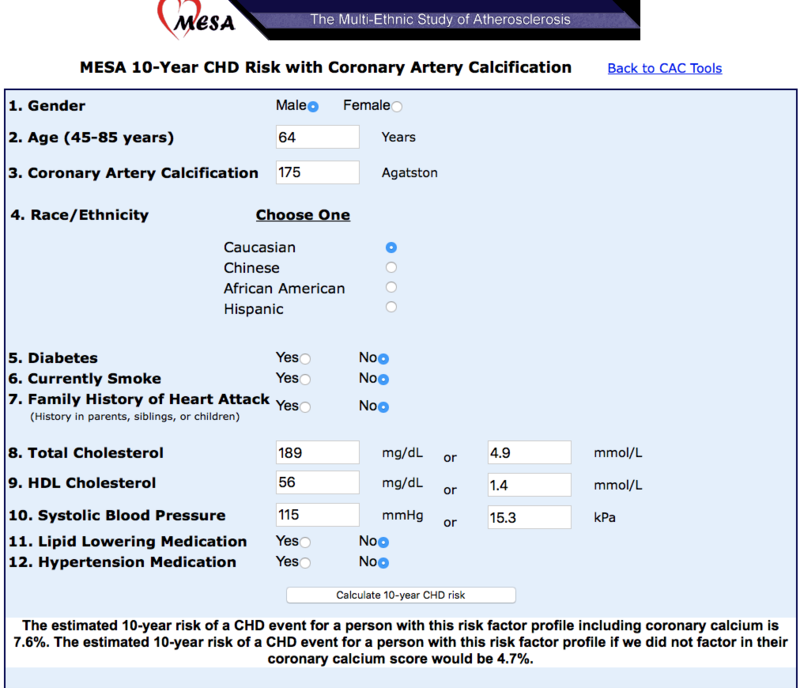 I referenced the ACC/AHA ASCVD risk estimator tool (app available here) as the starting point but if I have information on my patient’s CACS I use a new and improved tool called the MESA risk score calculator. The MESA tool allows you to easily calculate how the CACS effects you or your patient’s 10 year risk of ASCVD. The Multi-Ethnic Study of Atherosclerosis (MESA) is a study of the characteristics of subclinical cardiovascular disease (disease detected non-invasively before it has produced clinical signs and symptoms) and the risk factors that predict progression to clinically overt cardiovascular disease or progression of the subclinical disease. MESA researchers study a diverse, population-based sample of 6,814 asymptomatic men and women aged 45-84. Approximately 38 percent of the recruited participants are white, 28 percent African-American, 22 percent Hispanic, and 12 percent Asian, predominantly of Chinese descent. age, gender, race/ethnicity, diabetes (yes/no), current smoker (yes/no), total and HDL cholesterol, use of lipid lowering medication (yes/no), systolic blood pressure (mmHg), use of anti-hypertensive medication (yes/no), any family history of heart attack in first degree relative (parent/sibling/child) (yes/no), and a coronary artery calcium score (Agatston units). In many cases the CACS dramatically lowers or increases the risk estimate. The 10 year risk of a CHD event almost doubles from 4.7% to 7.6% when the CACS is added to the standard risk factors and moves into a range where we need much more aggressive risk factor modification. On the other hand if we enter in zero for this same patient the risk drops to a very low 1.9%. It can also be used to help modify risk-enhancing behaviors. For example if you click smoker instead of non-smoker the risk goes from 4.7% to 7.5%. Thus, you can tell your smoking patient that his risk is halved if he stops. Discussions on the value of tighter BP control can also be informed by the calculator. For example, if our 64 year old’s systolic blood pressure was 160 his risk has increased to 6.8%. How Does Your CACS Compare To Your Peers? 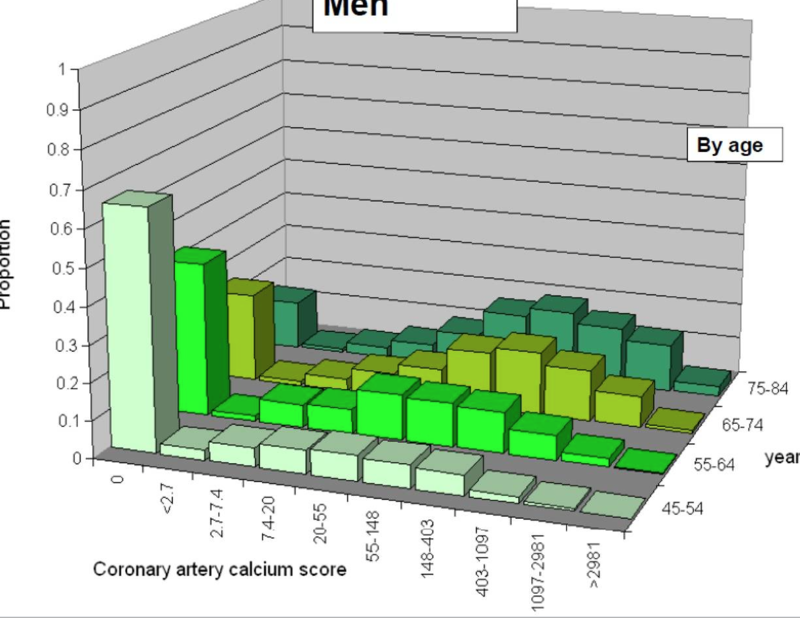 The Coronary Artery Calcium (CAC) Score Reference Values web tool will provide the estimated probability of non-zero calcium, and the 25th, 50th, 75th, and 90th percentiles of the calcium score distribution for a particular age, gender and race. Additionally, if an observed calcium score is entered the program will provide the estimated percentile for this particular score. These reference values are based on participants in the MESA study who were free of clinical cardiovascular disease and treated diabetes at baseline. These participants were between 45-84 years of age, and identified themselves as White, African-American, Hispanic, or Chinese. The current tool is thus applicable only for these four race/ethnicity categories and within this age range. The calculator tells us that 75% of 64 year old white males have a zero CACS and that the average CACS is 61. Unlike SAT scores or Echo Board scores you don’t want your CACS percentile status to be high. Scores >75th percentile typically move you to a higher risk category, whereas scores <25th percentile move you to a lower risk category, often with significant therapeutic implications. Scores between the 25th and 75th percentile typically don’t significantly change the risk calculation. If we change the gender from male to female on our 64 year old the risk drops considerably from 4.7% down to 3.3%. 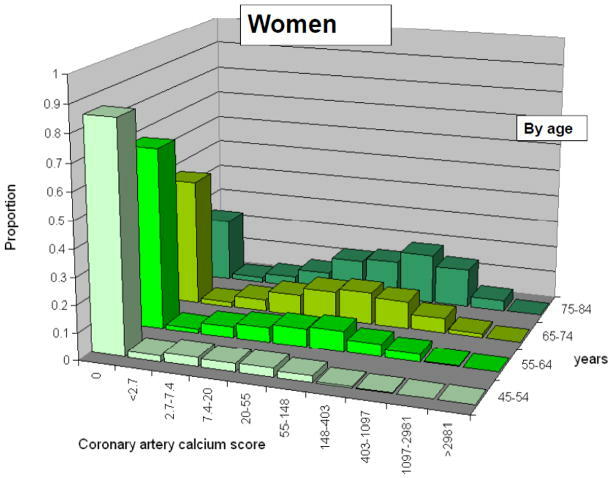 This graph demonstrates that over 20% of women between the ages of 75 and 84 years will have zero calcium scores. The graph for men in that same range shows that only around 10% will have a zero CACS. I’ve been asked what the upper limit is for CACS but I don’t think there is one. I’ve seen numerous patients with scores in the high two thousands and these graphs show individuals in the lowest age decile having scores over 2981. If you want to be proactive about the cardiovascular health of yourself or a loved one, download the MESA app and evaluate your risk. Ask your doctor if a CACS will help refine that risk further. In October, 2016 the skeptical cardiologist predicted that Donald Trump’s coronary calcium score, if remeasured, would be >100 . At that time I pointed out that this score is consistent with moderate coronary plaque build up and implies a moderate risk of heart attack and stroke. Trumps’ score gave him a seven-fold increase risk of a cardiovascular event in comparison to Hilary Clinton (who had a zero coronary calcium score) . Yesterday it was revealed by the White House doctor , Ronny Jackson, that Trump’s repeat score was 133. I was able to predict this score because we knew that Trump’s coronary calcium was 98 in 2013 and that on average calcium scores increase by about 10% per year. I pointed out that his previous score was average for white men his age and his repeat score is also similar to the average white male of 71 years. Taking aspirin 81 mg and rosuvastatin (Crestor) 10 mg.
His 10 year risk of heart attack or stroke is 16.7%. 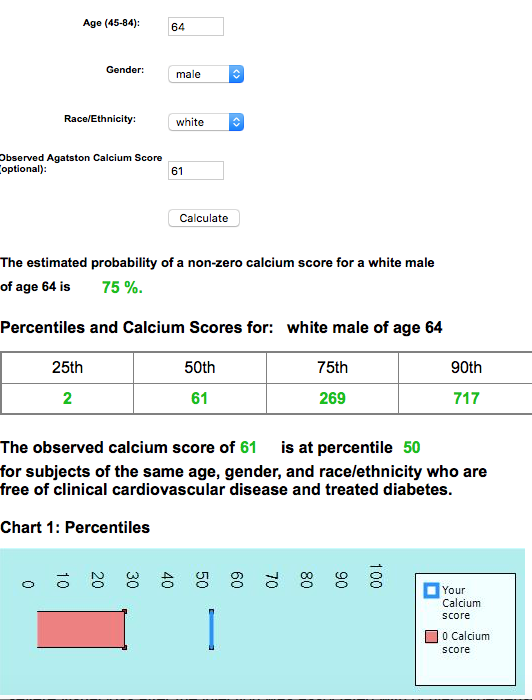 Given that his calcium score is average it doesn’t change his predicted risk and the conclusion is that his risk is identical to the average 71 year old white man-moderate. We also know that Trump had an exercise stress echocardiogram which was totally normal and therefore can be reasonably certain that the moderate plaque build up in his arteries is not restricting the blood flow to his heart. The New York Times article on this issue, entitled “Trump’s Physical Revealed Serious Heart Concerns, Outside Experts Say” however, presents a dramatically worrisome and misleading narrative. It quotes several cardiologists who were very concerned about Trump’s high LDL level, weight and diet. It’s interesting that some of the experts quoted in the NY Times piece feel that Trump’s Crestor dose should be increased in light of the recent NY Times piece questioning whether the elderly should take statins at all. If we have serious concerns about Trump’s heart then we should have the same concerns about every 71 year old white man because he is totally average with regard to cardiac risk. In addition he is on a statin and on aspirin, the appropriate drugs to reduce risk. In contrast to the average 71 year old male he has had a battery of cardiac tests which show exactly where he stands cardiac wise. Most of these cardiac tests we would not recommend to an asymptomatic individual of any age. Jackson revealed that Trump had an EKG and an echocardiogram. His ECG, or commonly EKG, was normal sinus rhythm with a rate of 71, had a normal axis, and no other significant findings. He had a transthoracic echocardiogram done, which demonstrated normal left ventricular systolic function, an ejected fraction of 60 to 65 percent, normal left ventricular chamber size and wall thickness, no wall motion abnormalities, his right ventricle was normal, his atria were grossly normal, and all valves were normal. So our President has a normal heart for a 71 year old white male. This automatically puts him at moderate risk for heart attack and stroke over the next 10 years but he is being closely monitored and appropriately treated and should do well. N.B. I see that Trump’s LDL was reported previously as 93. The current LDL of 143 suggests to me that he has not been taking his Crestor. Although most nutritional authorities are now admitting that reducing saturated fat consumption by substituting carbohydrates was really bad advice, they, for the most part, are still sticking to the overall concept of limiting all saturated fats to <10% of daily calories and substituting “healthy” polyunsaturated fats for “unhealthy” saturated fats whenever possible. The recommendation to limit intake of calories from saturated fats to less than 10 percent per day is a target based on evidence that replacing saturated fats with unsaturated fats is associated with reduced risk of cardiovascular disease. The limit on calories from saturated fats is not a UL set by the IOM. For most calorie levels, there are not enough calories available after meeting food group needs to consume 10 percent of calories from added sugars and 10 percent of calories from saturated fats and still stay within calorie limits. Recommendations to limit saturated fatty acids (SFAs) to <10% of calories persist, despite a spate of recent meta-analyses showing no relationship between saturated fat consumption and coronary heart disease (CHD, also known as ischemic heart disease (IHD)). In addition, it should be abundantly clear by now that not all SFAs behave the same with respect to our lipids or our IHD risk. Most SFAs come from animal origins, including meat and dairy products. The types of SFAs differ markedly between meat and dairy products; the associated nutrients and their interaction with SFAs also differs widely and all of this is likely to affect the risk of IHD. There is quite a bit of evidence that dairy fat actually lowers the risk of IHD. For example, in the MESA (Multi-Ethnic Study of Atherosclerosis) study, each 5-g/d intake of dairy SFAs was associated with a 16% lower risk of IHD, whereas each 5-g/d intake of meat SFAs was related to a 29% higher risk of IHD. Despite this, current guidelines continue to repeat the unsubstantiated recommendation to consume low fat dairy over full fat dairy. Hopefully, a paper just published in the American Journal of Nutrition, will provide the nail in the coffin of the concept that all saturated fats are similar in their affects on blood lipids and cardiovascular risk and should be restricted. This study found that higher intakes of SFA in 35,597 Dutch men and women were associated with lower risks of ischemic heart disease (IHD). In other words, the more SFA the Dutch eat, the less their chance of having a heart attack. And, the association “did not depend on the substituting macronutrient.” Those who ate less saturated fats and more “healthy” polyunsaturated fats did no better than those who substituted carbohydrates. short-to-medium chain SFAs (myristic acid, the sum of pentadeclyic and margaric acids, and SFAs from dairy sources including butter, cheese, and milk and milk products. Skeptics amongst my readers might think that this study was funded by the dairy industry, but as Marion Nestle pointed out on her Food Politics blog, support came from Unilever, who would have a vested interest in promoting their low saturated fat/high polyunsaturated fat margarines as substitutes for butter fat. This is only one of 11 industry-funded studies with findings different from what the sponsors would have liked, versus 105 studies with findings supporting products of the sponsors (since Marion has been tracking such studies). It’s likely that some saturated fats, especially when eaten immoderately, without an otherwise balanced and diverse diet, can increase your risk of heart disease. However, the saturated fats that come from dairy products are clearly not contributing to heart disease risk or obesity and our nutritional guidelines should recommend full fat dairy, not low fat or non fat products that require addition of added sugar to maintain palatability. Why is death from coronary heart disease declining in the US at the same time that obesity and diabetes rates are climbing? Two editorials recently published in The Lancet show the widely varying opinions on the optimal diet for controlling obesity , diabetes and coronary heart disease that experts on nutrition, diabetes and heart disease hold. 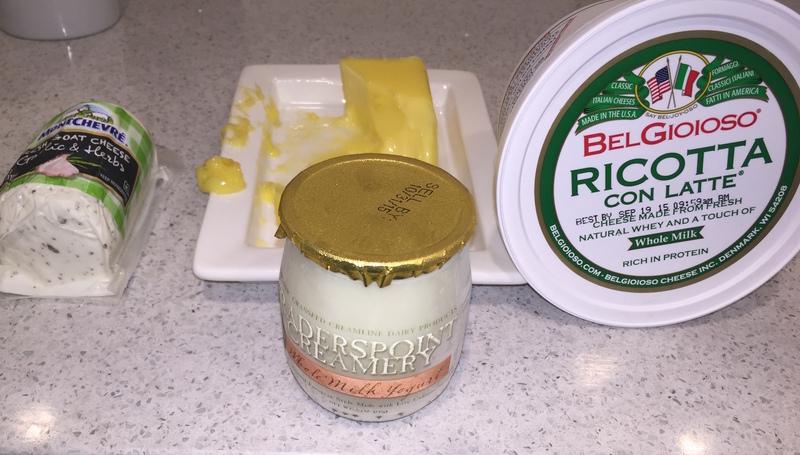 Typical innocent and usual suspects rounded up in the war on fat: Cheese-data show it lower heart disease risk Full fat yogurt (Trader’s Point Creamery)-data show it is associated with lower heart disease risk Butter-Delicious. Used in moderation not a culprit. The first paper contains what I would consider the saturated fat “traditionalist” viewpoint. 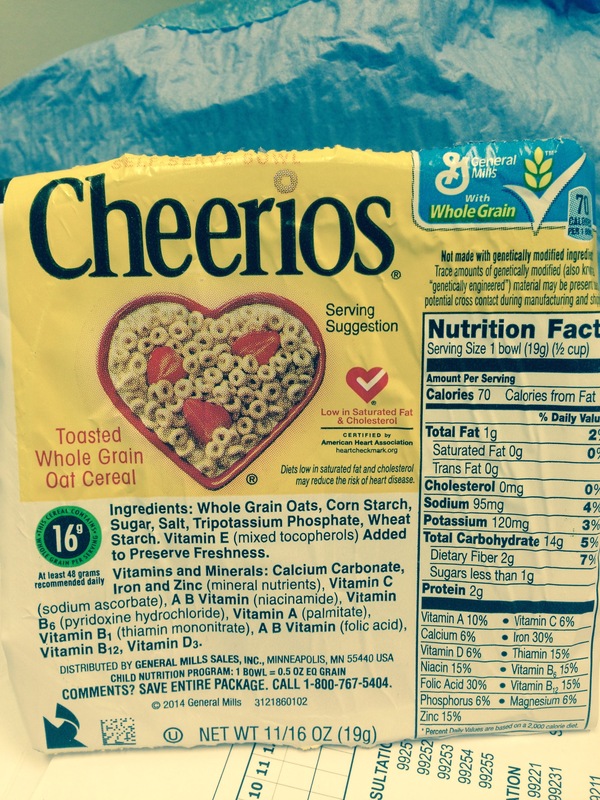 This is a modification of the misguided concept that was foisted on the American public in the 1980s and resulted in the widespread consumption of industrially produced trans-fats and high sugar junk food that was considered heart healthy. The traditionalists have shifted from condemning all fats to vilifying only saturated and trans fats. They would like to explain at least part of the reduction in coronary heart mortality as due to lower saturated fat consumption and the accompanying lowering of LDL (“bad”) cholesterol. The SFA traditionalists fortunately are in decline and more and more in the last five years, prominent thinkers, researchers and scientists working on the connection between diet and the heart believe saturated fats are neutral but sugar and refined carbohydrates are harmful in the diet. Darius Mozzafarian, a highly respected cardiologist and epidemiologist, who is dean of the School of Nutrition Science and Policy at Tufts, wrote the second editorial and is what I would term a saturated fatty acid (SFA) progressive. He makes the following points which are extremely important to understand and which I have covered in previous posts. I’ve included his supporting references which can be accessed here. Overall, increases in refined starches, sugars, and other ultraprocessed foods; advances in food industry marketing; decreasing physical activity and increasing urbanisation in developing nations; and possibly maternal–fetal influences and reduced sleep may be the main drivers of obesity and diabetes worldwide". "SFAs are heterogeneous, ranging from six to 24 carbon atoms and having dissimilar biology. For example, palmitic acid (16:0) exhibits in vitro adverse metabolic effects, whereas medium-chain (6:0–12:0), odd-chain (15:0, 17:0), and very-long-chain (20:0–24:0) SFAs might have metabolic benefits.4 This biological and metabolic diversity belies the wisdom of grouping of SFAs based on a single common chemical characteristic—the absence of double bonds. Even for any single SFA, physiological effects are complex: eg, compared with carbohydrate, 16:0 raises blood LDL cholesterol, while simultaneously raising HDL cholesterol, reducing triglyceride-rich lipoproteins and remnants, and having no appreciable effect on apolipoprotein B,  5 the most salient LDL-related characteristic. Based on triglyceride-lowering effects, 16:0 could also reduce apolipoprotein CIII, an important modifier of cardiovascular effects of LDL and HDL cholesterol. SFAs also reduce concentrations of lipoprotein(a) ,6 an independent risk factor for coronary heart disease." "Dietary SFAs are also obtained from diverse foods, including cheese, grain-based desserts, dairy desserts, chicken, processed meats, unprocessed red meat, milk, yoghurt, butter, vegetable oils, and nuts. Each food has, in addition to SFAs, many other ingredients and characteristics that modify the health effects of that food and perhaps even its fats. Judging the long-term health effects of foods or diets based on macronutrient composition is unsound, often creating paradoxical food choices and product formulations. Endogenous metabolism of SFAs provide further caution against oversimplified inference: for example, 14:0 and 16:0 in blood and tissues, where they are most relevant, are often synthesised endogenously from dietary carbohydrate and correlate more with intake of dietary starches and sugars than with intake of meats and dairy.4"
"These complexities clarify why total dietary SFA intake has little health effect or relevance as a target. Judging a food or an individual's diet as harmful because it contains more SFAs, or beneficial because it contains less, is intrinsically flawed. A wealth of high-quality cohort data show largely neutral cardiovascular and metabolic effects of overall SFA intake.7 Among meats, those highest in processing and sodium, rather than SFAs, are most strongly linked to coronary heart disease.7Conversely, higher intake of all red meats, irrespective of SFA content, increases risk of weight gain and type 2 diabetes; the risk of the latter may be linked to the iron content of meats.2, 8 Cheese, a leading source of SFAs, is actually linked to no difference in or reduced risk of coronary heart disease and type 2 diabetes.9, 10 Notably, based on correlations of SFA-rich food with other unhealthy lifestyle factors, residual confounding in these cohorts would lead to upward bias, causing overestimation of harms, not neutral effects or benefits. To summarise, these lines of evidence—no influence on apolipoprotein B, reductions in triglyceride-rich lipoproteins and lipoprotein(a), no relation of overall intake with coronary heart disease, and no observed cardiovascular harm for most major food sources—provide powerful and consistent evidence for absence of appreciable harms of SFAs." "a common mistake made by SFA traditionalists is to consider only slices of data—for example, effects of SFAs on LDL cholesterol but not their other complex effects on lipids and lipoproteins; selected ecological trends; and expedient nutrient contrasts. Reductions in blood cholesterol concentrations in Western countries are invoked, yet without systematic quantification of whether such declines are explained by changes in dietary SFAs. For example, whereas blood total cholesterol fell similarly in the USA and France between 1980 and 2000, changes in dietary fats explain only about 20% of the decline in the US and virtually none of that which occurred in France.11Changes in dietary fats11 simply cannot explain most of the reductions in blood cholesterol in Western countries—even less so in view of the increasing prevalence of obesity. Medication use also can explain only a small part of the observed global trends in blood cholesterol and blood pressure. Whether decreases in these parameters are caused by changes in fetal nutrition, the microbiome, or other unknown pathways remains unclear, thus highlighting a crucial and greatly underappreciated area for further investigation." The overall evidence suggests that total SFAs are mostly neutral for health—neither a major nutrient of concern, nor a health-promoting priority for increased intake. I’ve written about this a lot. The most baffling aspect of this is the promotion of low or non-fat dairy. There is no evidence that low fat dairy products are healthier than full fat dairy products. Non-fat yogurt filled with sugar should be considered a dessert, not a healthy food. "Continued focus on modifying intake of SFAs as a single group is misleading—for instance, US schools ban whole milk but allow sugar-sweetened skim milk; industry promotes low-fat foods filled with refined grains and sugars; and policy makers censure healthy nut-rich snacks because of SFA content.13 "
It is extremely hard to change most people’s opinions on dietary fat. My patients have been hearing the SFA traditionalist dogma for decades and thus it has become entrenched in their minds. When I present to them the new progressive and science-based approach to fat and saturated fat some find it so mind boggling that they become skeptical of the skeptical cardiologist! Hopefully, in the next few years, the progressive SFA recommendations will become the norm and maybe , some day in the not too distant future, the inexplicable recommendations for low-fat or non fat dairy will disappear. As more data accumulates we may become SFA enthusiasts! For another viewpoint (?from an SFA enthusiast) and a detailed description of both editorials see Axel Sigurdsson’s excellent post here. The skeptical cardiologist recently spent a week in the Basque region of Spain intensively researching dietary and lifestyle choices of this unique area. Spain borders the Mediterranean and is often included in those countries that are considered to be the source of the Mediterranean diet (MD) which I recommend to my patients. For a good summary of the Mediterranean “diet pyramid” check out this 1995 article. The diet is closely tied to traditional areas of olive cultivation in the Mediterranean region. I stayed in a small beach town, Deba, in Spain which is half way between Bilbao (famous for its Guggenheim museum) and San Sebastian. There were very few non-Spanish tourists in Deba so presumably the dietary and lifestyle choices I observed are representative of current Basque choices although likely different from the early 1960s. I found the Basque people in Deba to be welcoming and joyful and European statistics show the Basque to be among the most satisfied with their overall life and job conditions. Interestingly, the life expectancy of the Basque population in 2000 in years was 75.8 for men and 83.8 for women, and by 2011 it had increased to 79.3 and 86.1, respectively. The Basque women live longer than women in any other country in Europe. Walking around the squares of Deba I observed two activities which I would ordinarily have presumed would result in a low life expectancy: lots of cigarette smoking and lots of Jamón consumption. Ham was everywhere in Deba, from the supermarkets to the cafes. 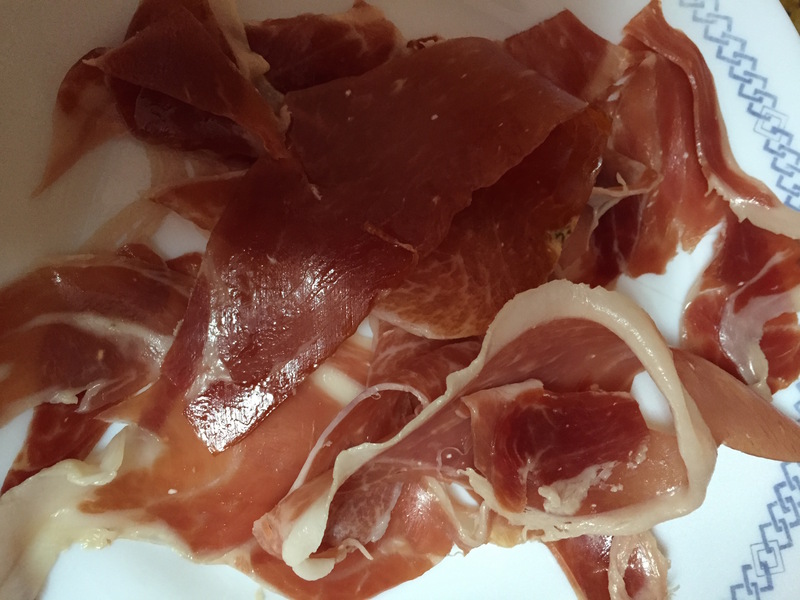 A typical appetizer choice was a plate full of Jamón Ibérico. Most of the pintxos (Basque-style tapas) we saw consisted of Jamon on bread. “Picture paper-thin strips of dark red ham like petals ringing a hand painted plate. Imagine big honest hams curing in the mountain air. 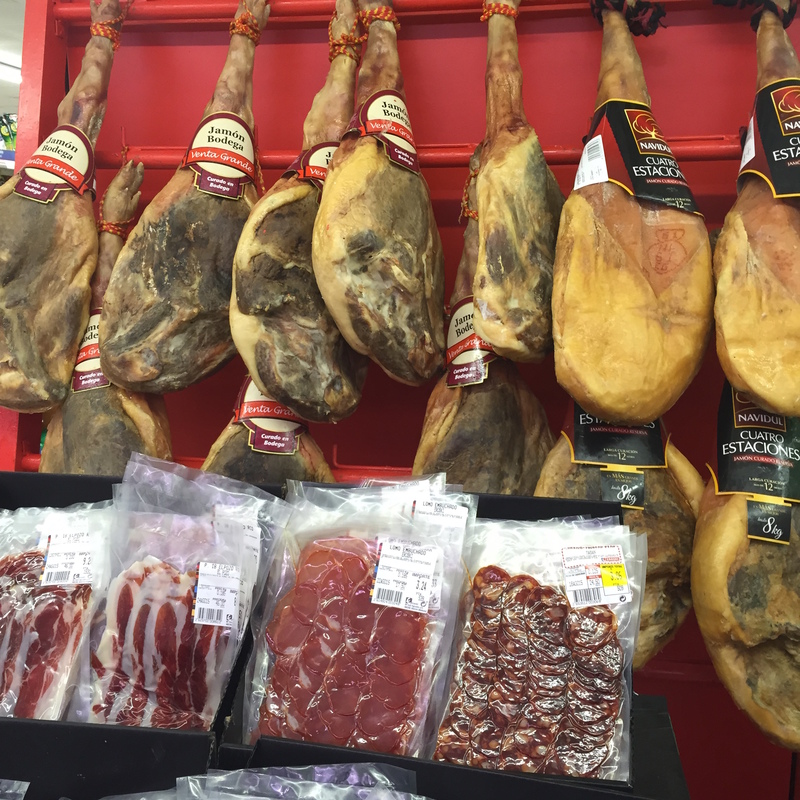 Picture individual hams resting on stands in family kitchens throughout Spain with a long slim knife at hand for any and all to slice a treat. Jamón, dry-cured ham, has been eaten in Spain and other Mediterranean countries since ancient times. There are basically two kinds: hams from rustic and free range pigs (Iberia, Corsican or Cinta Senese) and hams from intensively-reared white pigs (Serrano, Parma, Bayonne). Both hams involve a moderate salting and a ripening period of 7-14 months for white pigs and over 20 months for Iberian hams. When they are finished curing, they have an incredibly complex taste, distinct marbling, a deep red color and an intense ham flavor. Health Consequences of Eating Jamón Ibérico. A 100 g serving of Jamon Iberico contains 375 calories, 200 of them from fat. Of the total 22 grams of fat, 6.5 grams is saturated, 2 grams polyunsaturated, and 13 grams monounsaturated . There are 43 grams of protein and a lot of sodium ( 1.1 grams). If we follow most current nutritional guidelines we would be advised to avoid Jamon because it is a considered a processed meat and it contains lots of salt and saturated fat. Despite eating lots of Jamon, however, the Spanish and Basque do very well in terms of longevity and rates of heart disease. The Basque good health could be related to any number of factors. They consume lots of fresh fish caught in nearby ports and prepared with lots of garlic and olive oil. (I had the best monkfish of my life in a cider house in the hills near Deba). Fish and olive oil are clearly beneficial dietary components. 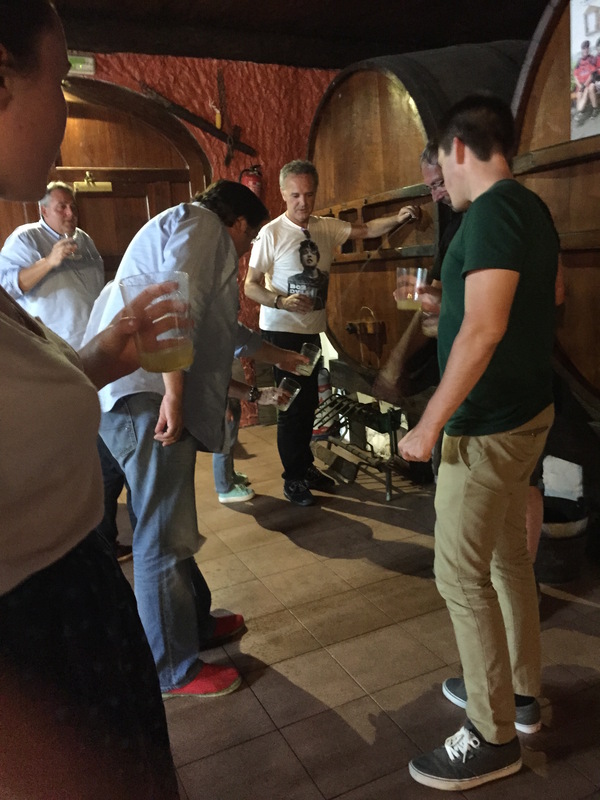 They also drink alcohol in varied forms, including locally sourced apple cider, beer and fine local wines from Rioja. They are active and they have long stretches of beautiful coastline to hike (including this geopark), some of the best surfing beaches in the world, and hills for cycling. Ultimately, a healthy lifestyle consists of enjoyable and sustainable exercise and an enjoyable, sustainable and palatable diet composed of a combination of foods (mostly plants) , interacting in myriad unmeasurable ways. Focusing on specific fat (other than industrially produced trans fats) or sodium content is not a particularly useful approach. I think Jamon can be considered part of a healthy Mediterranean diet when consumed in moderation and when combined with an active physical lifestyle. It makes a wonderful addition to anyone’s diet. 1. Tracking salt consumption (unless you make all your meals at home from scratch or buy from fast food restaurants) is very tedious. After reviewing the latest scientific publications on salt, however, I have to think that for most people, it is not worth the effort to track daily salt consumption. Yes , this is nutritional heresy and goes against what my patients have been reading from authoritative nutritional sources for decades. The findings are not applicable to all Americans because more than 50% of participants in the DASH study had hypertension or prehypertension, more than 50% of participants were of African ancestry, potassium intake was markedly lower than in the general U.S. population, the trial involved only 412 persons, and a limited range of sodium intake was studied (1.5 to 3.3 g per day). I asked most of my patients this week about their salt consumption. None of them could tell me what their average daily salt consumption was. However, almost to a man (or woman) they told me they had been consciously limiting their consumption of salt because they knew that this was healthy. Thus, the 35 year old white woman with a blood pressure of 110/50 , palpitations and periodic dizzy spells is following the same recommendations to limit salt consumption as the 70 year old African-American with poorly controlled hypertension. In the last few years this focus on lower salt consumption has been questioned after close analysis by the Institute of Medicine and the Cochrane Analysis. Two articles in the prestigious New England journal of Medicine published a few weeks ago have convinced me that most individuals who are following a Mediterranean diet do not need to be concerned about their salt consumption. very few participants had an estimated sodium intake of less than 2.3 g per day, and almost none had an intake of less than 1.5 g per day. This suggests that, at present, human consumption of extremely low amounts of sodium for prolonged periods is rare. found a steep slope for this association among study participants with sodium excretion of more than 5 g per day, a modest association among those with sodium excretion of 3 to 5 g per day, and no significant association among those with sodium excretion of less than 3 g per day. 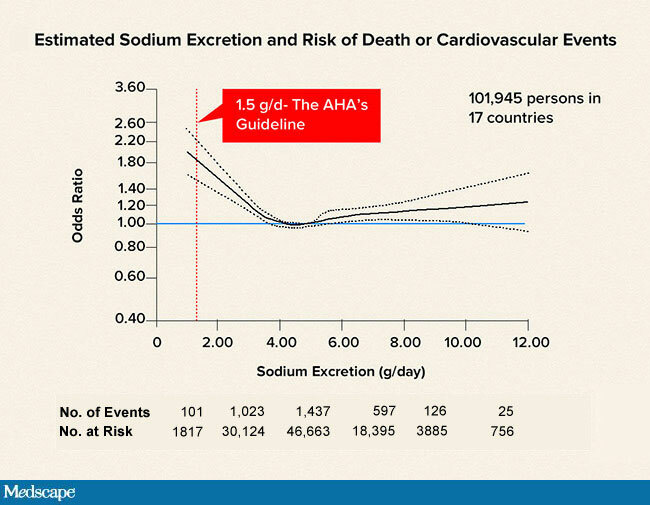 This graph of data from the PURE study shows that lower levels of sodium excretion , below about 3 grams per day were associated with a higher risk of death. Starting above about 5 grams per day the risk of death increased with increasing amounts of sodium excretion. This is quite a shocker for those of us who have assumed for the last 20 years that the less salt we consumed the longer we would live. Drawing less controversy were the findings from these two studies on potassium consumption. Higher levels of potassium consumption were associated with lower blood pressures and lower risk of death. The authors point out that high potassium intake may simply be a marker of healthy dietary patterns that are rich in potassium (e.g., high consumption of fruit and vegetables). You can read more about these papers, including critical and positive comments at the heart.org here. Here is what I will be telling my patients about salt after a week of tracking my consumption and reading the relevant scientific literature. Spend a day or two accurately tracking your consumption of salt to educate yourself. I found this app to be really helpful. I’ll expand on this in a future post. Recognize that not everybody needs to follow a low salt diet. If your blood pressure is not elevated and you have no heart failure you don’t need to change your salt consumption. If your blood pressure is on the low side and especially if you get periodic dizzy spells, often associated with standing quickly liberalize your salt intake, you will feel better. If you have high blood pressure, you are the best judge of how salt effects your blood pressure. In the example I gave in a previous post, my patient realized that all the salt he was sprinkling on his tomatoes was the major factor causing his blood pressure to spike. The kidneys do a great job of balancing sodium intake and sodium excretion if they are working normally. If you have kidney dysfunction you will be more sensitive to the effects of salt consumption on your blood pressure and fluid retention. If you are following a Mediterranean diet with plenty of fresh fruits and vegetables you are going to be in the ideal range for both potassium and sodium consumption. Public health experts are always seeking a “one size fits all” message to give the public. In the case of salt consumption, however, the message of less is better does not apply to all. Tofu: Heart Healthy SuperFood or Environmental Nightmare? Most of my patients think tofu and soy protein are particularly heart healthy food choices. Since tofu contains significant calcium and protein, it is often viewed as a healthier alternative to dairy (which has inappropriately been labeled as heart unhealthy). A huge growth in the use of soy protein occurred between 1996 and 2009 with annual sales of foods containing soy expanding from $1 billion to $4.5 billion. This appears to have been driven by a perception that soy is more healthful than other sources of protein (especially animal protein). 25 grams of soy protein a day, as part of a diet low in saturated fat and cholesterol, may reduce the risk of heart disease. Does soy deserve this designation? Should we be purposefully trying to consume more soy to lower our risk of heart disease? Early studies, which compared consumption of 25 grams of soy protein versus control protein consumption, suggested a slight reduction in total and bad cholesterol levels. The problem with these studies is that a flawed surrogate marker (cholesterol or bad cholesterol) is being studied in place of the real disease (atherosclerosis and its associated complications, including heart attack and stroke). We now know that dietary interventions or drug therapies that lower cholesterol don’t necessarily reduce heart attacks or prolong life. In 2000, the AHA published a document supporting the concept that 50 grams of soy protein per day would reduce heart disease risk . In the majority of 22 randomized trials, isolated soy protein with isoflavones, as compared with milk or other proteins, decreased LDL cholesterol concentrations; the average effect was approximately 3%. This reduction is very small relative to the large amount of soy protein tested in these studies, averaging 50 g, about half the usual total daily protein intake. No significant effects on HDL cholesterol, triglycerides, lipoprotein(a), or blood pressure were evident. Among 19 studies of soy isoflavones, the average effect on LDL cholesterol and other lipid risk factors was nil. Soy protein and isoflavones have not been shown to lessen vasomotor symptoms of menopause, and results are mixed with regard to soy’s ability to slow postmenopausal bone loss. The efficacy and safety of soy isoflavones for preventing or treating cancer of the breast, endometrium, and prostate are not established; evidence from clinical trials is meager and cautionary with regard to a possible adverse effect. For this reason, use of isoflavone supplements in food or pills is not recommended. Thus, earlier research indicating that soy protein has clinically important favorable effects as compared with other proteins has not been confirmed. There is no scientific evidence that consuming soy protein lowers your risk of heart disease. There is no evidence that substituting soy protein for animal protein lowers your risk of heart disease. Certainly, if you like tofu (does anyone really like tofu?) and/or you have a philosophical desire to avoid meat and dairy consumption, tofu can provide a lot of the protein and calcium that you cannot get from eating only vegetables. What does the searching the Internet tell us about tofu? The “Foundation for Integrative Medicine” (when you see the word “integrative” before the word “medicine,” substitute “unproven” and move to another website. This is a marker for quackery) cites similar claims, adding that regular tofu consumption reduces breast and lung cancer and osteoporosis. None of these claims are supported in the medical literature. You can also read about why soy “May be a health risk and environmental Nightmare” here. The majority of soy grown in the US comes from genetically modified plants from Monsanto which have had a gene inserted that allows them to resist Roundup. Consequently, farmers can spray all the Roundup they want on the plants. Nobody knows if this is a health risk or not. Monsanto likes to make the case that the overall effects of RoundupReady soy, as they like to call it, are positive, whereas Mother Jones writes that soy is “Scarier Than You Think”. My bottom line recommendation on soy is that, like all other foods, we should try to consume it in its least industrially processed form as part of a balanced diet of real foods. There is no scientifically proven reason to avoid it or seek it out.